50 pound strength Dacron line is ideal for these Dowel Series kites. All the construction details for the bridle are contained in the large photo below. Look and read carefully, and you can't go wrong on this rather important bit! TIP: Secure the slip knots onto the dowels with enough wood glue to ensure the knots can never slip along the dowel. They won't loosen either. Hold the short bridle line up so all the bridle lines are straight, with the kite laying flat on the table or floor. 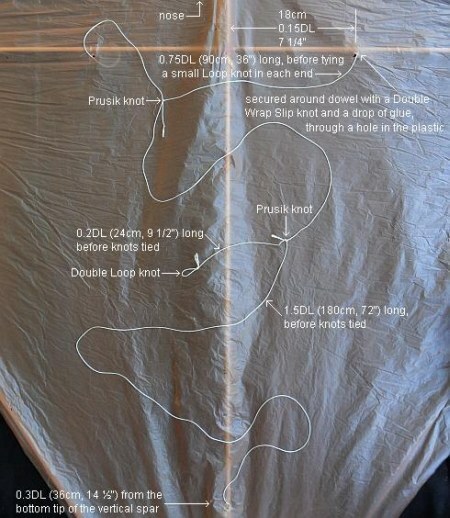 Make sure the Prusik knot closest to the kite is adjusted to the middle. Right over the vertical spar. Referring to the diagram below, shift the other Prusik knot to the shown position. It's not necessarily the perfect position for your individual kite, but it should at least fly on the first attempt! Later, you can experiment with shifting the position towards or away from the nose, a little at a time, to improve how high your kite flies. No such limitations are necessary for an e-book, so all the images are larger and sharper. 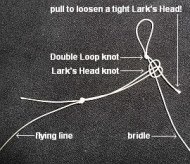 Make up a flying line and attach it to the bridle with a Lark's Head Knot. See the photo, where the Lark's Head has been left loose. Now, drop the rigged kite so it floats face-down towards the floor. If it tends to drop its nose and glide forward, add weight near the bottom corner of the sail until the gliding stops. For example, wrap some extra tape around the vertical spar near the tail end. Firstly, if it's very windy outside, stay home! 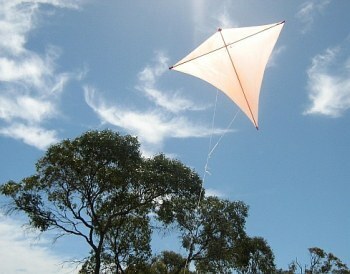 This is a light-wind kite and won't like being launched in a gale. The picture shows the original Dowel Diamond on its first outing, hovering at around tree-top height in a dying late-evening breeze. The Prusik knot on the bridle line can loosen off a little over time. If necessary, pull on all the lines to tighten the knot up before a flying session. Assuming there is some breeze outside, just dangle the kite at arm's length until the wind catches it. As long as you feel the kite pulling, let out line slowly by taking loop after loop off the winder. Be cautious about letting line slip through your fingers. If a big gust hits the kite, the line could burn you! For any kite this big or bigger, it's a good idea to wear a cloth glove. Another approach is to get a helper to hold the kite up and let it go, on the end of maybe 15 meters (50 feet) of line. This way, the kite soon gets high enough to make it easy to let more line out. Have fun flying, and I hope you've enjoyed learning how to make a Diamond kite! Diamond kite stories of my real-life flying experiences are worth checking out! Illustrated with photos and videos, of course. Making The MBK Dowel Diamond Kite is one of my handy e-books of printable step-by-step instructions. It's a PDF file download. Those e-book instructions include even more handy hints which will ensure you get the most success possible when flying this particular design. They show you how to make the kite more transportable too, so you can remove a spar and roll the kite up into a slim bundle. If you feel your efforts really paid off when the the kite finally got airborne - please type a few paragraphs in here telling us all about it! P.S. I can only accept stories of at least 300 words. Just mention a few details like the weather, onlookers, the kite's behavior and so on - 300 words is easy! Very Satisfying First My-Best-Kite Experience!